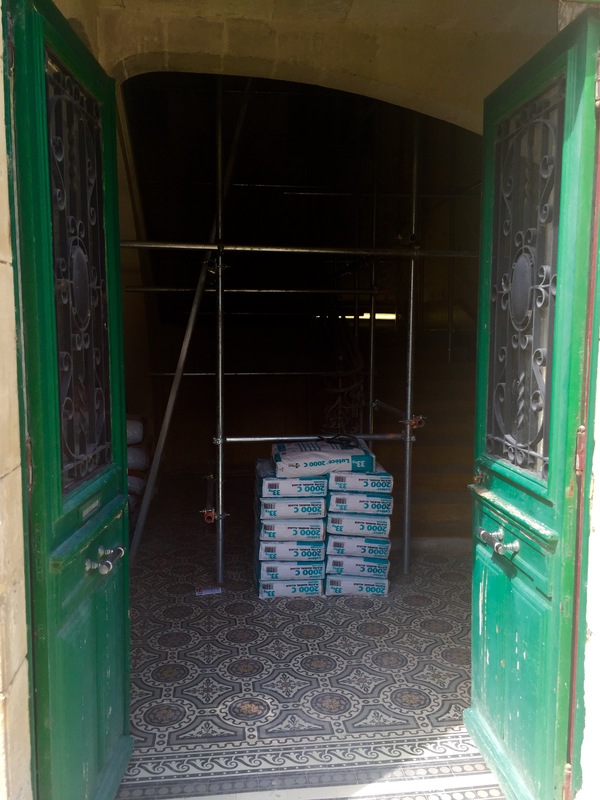 Progress Work on The Interior Of The Château. Our days have been busy here at the Château, so we apologize for the “Blog” post running a little later than normal! With us starting on the Interior side of the Château, we have been flat-out, working long days and late nights, but, this has been a job that we have been looking forward too. So far it’s been exciting, overwhelming and a challenge that we’ve had the pleasure of sharing with everyone. On top of that, we have started on the car park area, including a disabled car space by the Chateau entrance, for easy access. A water reservoir tank for the “in case” we ever have a fire at the Château, this is only for the fire engine to connect the hose to, which is approximately 120 Cubic meters. 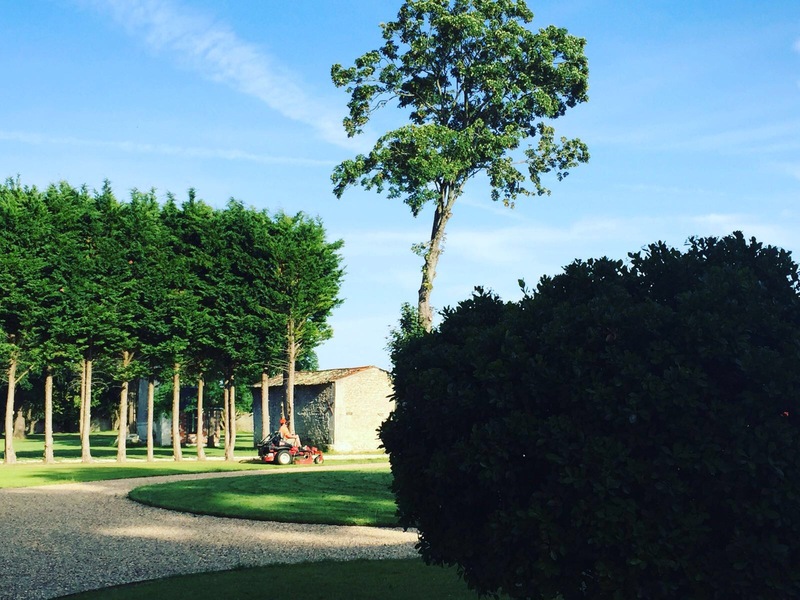 Some of the pathways have been widened, we used the old stone from around the Château to make a beautiful new 24m2 stone terrace, for our guests to sit and enjoy, the singing of the birds and watching the wild deer from the suite on ground floor, which is overlooking the parkland! We’ve been busy doing one of the most important Ceilings in the Château. The entrance ceiling, high above the main staircase it’s the first ceiling you will see when you walk through the main “Green” doors. This ceiling is going to make a statement, the pure pleasure between romance and the feeling that you’re standing back in time with the added on twist of modern features (due to requirement), with that beautiful centre piece, where we are going to be hanging on, a one of a kind chandelier, all the while overlooking the stunning stone and iron staircase, which has its own “wow” factor. We also worked on the hallway walls to get them ready for the decorative plaster panels, so we applied “One coat” plaster to the walls, this is a finished product, it takes about 5 stages to get this right, along with very good timing and skill! Stage one is applying the plaster, second is flattening with straight edge, the third is flattening, fourth flattening any lines in plaster and fifth is wet sponge and polishing it. The first four bathrooms and bedrooms (we are doing seven first off) have been sealed up, after we run around 21km, of electric wires, run all fire alarm wires, all the lighting, all the hot and cold pipes, all the plumbing for toilets and heating, so that about 600meters, we’ve sprayed all vermiculite to seal up all the gaps, for our fire rating. It’s been insulated, framed with the fire rating metal and we’ve double plaster boarded with fire rating boards. Our 1-hour fire rating doors arrived, they have been fixed to the hinges, with all the rooms having their new door now. The business side coming along slowly too, we have had a lot of meeting, inspections and licences that have needed to be organized, with approvals that are coming through, in drips and drops, this all has to happen before the next steps can even start. Slowly everything coming together if we’ve learned anything, over the almost two-year of doing this project, it’s that everything happens in its own time, we never expected it to take this long, but at least we know, it’s being done right. We have had some hard days, weeks and even months, everything that could go wrong, pretty much has gone wrong, orders, sizes, walls and stones falling down, close calls and even some unforeseen changes. We would be lying if we didn’t say, that at some point or another it’s been overwhelming and even a little hard to keep going. But we remind ourselves on a project like this, mishaps and complications will arise, it’s how we manage as a team that make or break us. Everyone has a job, even the little hands. Do you find it a challenging project? This sure is, but it’s a challenge where we can transform an already beautiful building, in to something breathtaking. We always knew it would be hard, the extent of it, well, only over time, has that truly hit us. As they say “nothing comes easy, only by hard work, will you achieve the end gaol” and for us that’s true, our end gaol, is being able to share this beautiful building and be the most romantic hotel that we can. Most defiantly, living in the countryside this beautiful, with all the wildlife and beautiful surrounding, snowy winters and sunflower summer, are worth it. Only if it’s necessary, only kidding, we do, we have big family dinner, every night, work a little longer and all fall straight to sleep ready for next day. Saturday’s are the only day we take off, for family time, exploring and spending times relaxing, sometimes even that is not always possible. If we know, what we known now, at the begging of the project. Would we rethink our choices at starting it? We wouldn’t, we would do exactly the same thing. We love the Chateau, and the challenges it has given us, and are proud of the achievement so far, the amount of work we’ve done to this point, was never expected from the beginning, so we might have paced ourselves a little bit more. How do you feel when you stop and see what you, as a team have accomplished? Honestly we shock ourselves, we don’t notice the big changes, like everyone else does, it’s not until we stop and go through before and after pictures, is when it really hits us. And then we feel proud, that all the hard work, the exhausting days, the hurting bodies, the blood and sweat, have been worth it. Still in awe of what you are all achieving. Something on my bucket list which will never realistically happen, is being achieved you all. I hope I can make it over there someday. I’d also like to visit the Chiodos in Malpertus, Italy! NextIt’s Our Two Year Project Anniversary.